Self Help Relationships Issues And Your Ego! 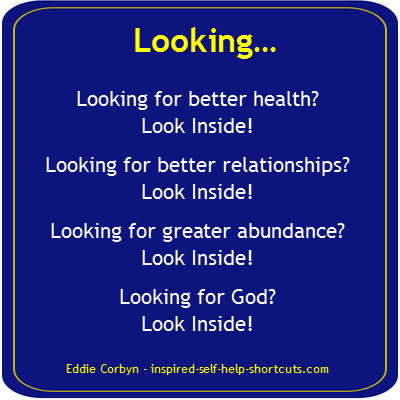 To truly benefit from the inspired self help relationships advice on this page, it's crucial to realize that the most important relationship we will ever have is the relationship with our self. Once we've taken care of that relationship, which means that we truly love our self, then all other relationships will be harmonious and loving! What do you think of yourself and how do view yourself? Do you approve of yourself and who you are? Or do you constantly criticize, devalue or condemn yourself through your thoughts, words and actions? Do you get angry with yourself often or do you love yourself unconditionally? Use these self help relationships shortcuts to help you to solve your personal issues on these subjects. Everyone has these issues, you, me and the majority of the world’s population has some kind of personal issues. And it’s up to each person to decide whether they want to deal with their issues or not. Remember, at the base level, everything is energy and everything is thought, thought is energy, they’re one and the same thing. The choice of changing how you choose to feel about something is tied to your beliefs and thoughts about it, and thus your ability to change always remains firmly in your hands. To really benefit from this forgotten knowledge, understanding how your ego creates pain and suffering is very helpful. Perhaps, due to previous arguments and disagreements with people you’re still holding a grudge or resentment towards them, so you have unresolved issues from the past. And now, that old hurt or that old wound hangs around in your system, energetically and psychologically until such a time that you do resolve it. You'll know if an issue is still present within you because anytime a similar challenge to one you had previously arises, the old issue will raise its head and cause the same discomfort and pain as it did previously. This gives you another opportunity to see it and, if so desired, to change it by redefining your thoughts and beliefs about it. There's no point trying to solve any problem by treating the symptoms. Sure, you can find temporary relief through taking medications and treating the symptoms and thus, temporarily, escaping from the pain. Or you can go directly to the root cause of all pain and suffering and deal with it once and for all. The reason why these issues arise and continue to manifest in our life is due to the personality construct of our physical mind or our ego (ego-self). Thus, to solve any problem, eventually, we need to get to the root cause of it, which is the action of our mind that’s controlled by our ego-self. Our ego-self is that part of our physical mind which consists of memories from our past experiences. Our ego-self only has access to the past and the present, and one of its functions is to record the past in order to assist us in making decisions to protect our physical being in our now reality. Challenges arise when we unconsciously rely on this past data to interpret meaning in our now reality, a reality that’s in a constant state of flux or change. Thus, meeting and interacting with people and perceiving events must be spontaneous, in "real time" and not tainted by the past. Our ego-self is not bad, but if overburdened it becomes negative and it will continue to be the cause of pain and suffering in our lives. Thus, our work is to gently and lovingly convince our ego-self, through awareness and understanding - that its place is as an adviser to self and not as a controller of our thinking. Let’s say that you have frequent arguments with your partner or perhaps you often get angry when someone in front of you drives too slowly or cuts in front of you. Whatever makes you angry; the reason for the anger is that your ego-self judges and believes that it is right and that the other person is wrong. Or maybe your partner goes out with some friends. And all the time they're gone you're running imagined scenarios, in which your partner is unfaithful, through your head. From your loving partner’s perspective they went out and had some innocent fun with their friends, they did nothing wrong! Meanwhile, due to your jealous nature, you're at home thinking about your partner being unfaithful and mulling it over in your mind. As more and more negative thoughts arise you get more and more anxious, until eventually you convince yourself and now believe that your partner actually is being unfaithful. And then, due to the jealousy brought about by the unconscious negative action of your ego-self’s control of your mind, when your partner returns home you confront them and accuse them of being unfaithful. Then an argument ensues causing pain and suffering for all those involved. We need to look at this very closely now. The scenario you played out in your head was not your partner’s reality, it was your own imagination fueled by your negative ego-self. So you got anxious or angry over a story that you created in your head or I should say a story that you allowed your negative ego-self to create. Thus, YOU created a fictitious story, a non-reality and then YOU got angry over it. That, my friend, is self-induced insanity. Is this kind of behavior really serving anyone in your life? And would it be better for everyone involved for you to move beyond the insanity created by your negative ego-self, by becoming aware of and changing the action of your mind? If you’re not aware of something you cannot change it. Thus awareness is the key to understanding all issues and challenges in your life and to being in a position where you can change things for the better – and in that process to regain control of your mind. 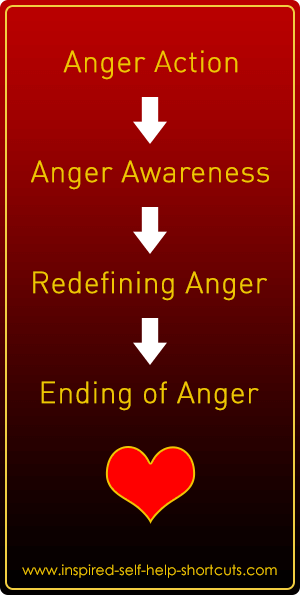 To begin doing this, the next time you realize that you’re about to get angry, over anything at all, see if you can catch the angry thought by being aware of it and then just dropping it. Or simply acknowledge it, thank it and then let it go by focusing upon something else. This self help confidence test page highlights a real ego-self event in my life. The first few times you do this you might realize just after the fact that you’ve been angry. At this stage it’s important not to get angry with yourself that you missed the angry thought and maybe even spoke in anger. Awareness of being unaware is awareness all the same! Because the essence of all of your thoughts gets reflected back to you in your daily life, if you desire loving relationships think loving thoughts often. Once you get into that habit you'll be happy and feel good often and hence, you’ll begin seeing more positive results in your life. If you catch yourself thinking unwanted thoughts often, realize that your ego-self still has some control of your thought process and that you have more work to do in the area of ego awareness. The more you practice ego awareness the more you can be assured that positive change will occur, but it might not happen overnight. The more consciously aware you become the more you will know! And remember: rather than being frustrated, annoyed or angry by the realization that you have more work to do, simply take control by gently reminding your ego-self of its place by refusing to pay attention to those unwanted thoughts, and eventually their power of attracting similar thoughts will naturally diminish. If you’re finding it difficult to feel good about yourself, read someone else's ideas on changing your mind on this feel good about yourself page. In each and every moment of our existence we have a choice, a choice of what to think. We all have free will and thus the ability to decide and to choose whether to think positive, loving and harmonious thoughts or negative, destructive, divisive, self-centered or egotistical thoughts. The one thing we can be assured of is that the essence of whatever thoughts we’ve paid the most attention to will be reflected back to us through the Universal mirror of our life experience. This means that when we judge our self or another we’ll see some kind of judgment reflected back to us in the Universal mirror of our life experience. Therefore, if we’re not satisfied with the reflections we’re getting in any moment of our lives; it’s up to us to initiate the desired change by thinking different thoughts and by only paying attention to wanted subjects. The impersonal mirror serves to unerringly reflect back to us whatever we’ve been thinking about and paying the most attention to. We initiate the desired change by offering and paying attention to different self-serving thoughts and by using our imagination to only focus upon wanted scenarios. And we must do this in spite of any and all of the unwanted scenarios and circumstances occurring right before our eyes. The current unwanted reflections came from our past thoughts, so once we refuse to continue thinking those thoughts the reflection of those things must diminish. Thus, change and a different preferred reflection must arise once we begin thinking new thoughts from a more consciously aware state of being. Only then can the Universal mirror of our life begin to offer a different reflection to us. There will be a time delay but ultimately the Universal mirror must and so will change, but this can only happen if we change first! Anyone truly interested in exploring relationships will begin to realize that everything and everyone is connected. No one lives in isolation that is impossible. Understanding relationships is really about understanding yourself and how, in essence, all relationships are spiritual in nature. Once we see how the ego-self operates we realize that the ego-self is not who we really are, so it's much easier to move beyond it. And once your ego-self is no longer in control of your thinking you'll be at peace with yourself and you'll spend more time in the present moment, the only moment there ever is. Considering that there really is only the present moment, it makes perfect sense to me, even rationally, to be happy now and feel good always. And being present more of the time you'll spend less time worrying about the past or the future and you’ll begin to allow all that you say you want to naturally and effortlessly flow to you. The deeper level Spiritual Guide section offers more information, clarifies and goes deeper into the eternal moment of Now. When you truly love yourself it doesn’t matter where you are or who you are with or even if you are alone, you are always at peace within yourself. Conversely, you don't love yourself if you're continually at war with your own thought process. If you repeatedly get angry with yourself because you continue to allow your ego-self to think unwanted thoughts, then there's no room for love because - where there's anger, love is not! If you're inquiring about self help relationships because you want to meet and share some time with a romantic partner or to improve an existing relationship, then I highly recommend that you read this self help relationship page about loving yourself and being real. And if you’re considering getting married, you may want to read this self help marriage page. Ultimately, meeting your ideal soul mate will result in experiencing the epitome of ecstasy, bliss and love. This confidence self help page suggests ways that you can prepare you for such a meeting. Have a Question on the Subjects of This Webpage? Please submit questions concerning: Ego-Self, Self Love and Relationships on this self help relationships page. Thank you. so please be patient, thanks. Your question will appear on a Web page exactly the way you enter it here. You can wrap a word in square brackets to make it appear bold. For example [my question] would show as my question on the Web page containing your question. Do you have some pictures or graphics that will add clarity to your question? Great! Click the button and find the first one on your computer. Select it and click on the button to choose it. Self Help Relationships – How to Solve My Boyfriend’s Ego Problems? Is Huge Embellishment Ego Action?